Britain Chief Veterinary Officer Debby Reynolds said farmers would be allowed to transport cattle and sheep directly to slaughter collection points - markets where animals are sorted into sizes before being sent on to slaughterhouses - and other cattle sale markets from Thursday. Following the outbreak of foot-and-mouth disease, confirmed on two farms in Surrey, southern England, government officials placed tight restrictions on the movement of animals, attempting to halt the spread of the disease. "These plans form the next step in our ongoing risk-based, staged approach to movement controls," Reynolds said in a statement. Confirmed cases of foot-and-mouth have so far not spread beyond a small area about 30 miles (50 kilometers) southwest of London. 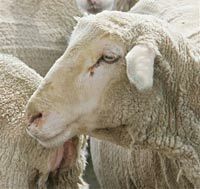 An epidemic of the disease in 2001 led to the slaughter of 7 million animals and shut British meat out of world markets for months. An investigation has concluded that the disease probably spread by human movement from a research laboratory facility in Pirbright, Surrey. The complex houses vaccine-maker Merial Animal Health - the British arm of U.S.-French pharmaceutical firm Merial Ltd. - and the government's Institute of Animal Health. Experts are still trying to determine exactly how the disease spread. Foot-and-mouth disease can be carried by wind and on the vehicles and clothes of people who have contact with infected animals. Around 200 animals on two farms near the lab complex tested positive for foot-and-mouth disease and were slaughtered. Foot-and-mouth disease affects cloven-hoofed animals including cows, sheep, pigs and goats. It does not typically infect humans, but its appearance among farm animals can have a far-reaching economic impact. Several countries have banned imports of British livestock, and Britain has voluntarily suspended exports of livestock, meat and milk products since the outbreak was identified Aug. 3.